A private gated home community in Novi offering a unique living experience for active adults, Terra features custom Prairie‑style ranch homes with a fresh modern look located in a tranquil setting surrounded by scenic woodlands. From the moment you pass through Terra’s gated entrance, down along its winding streets, past pockets of mature maples and beech trees, you’ll feel the stresses of the outside world slipping away. You’ll know you’re someplace special. You’ll feel at home. 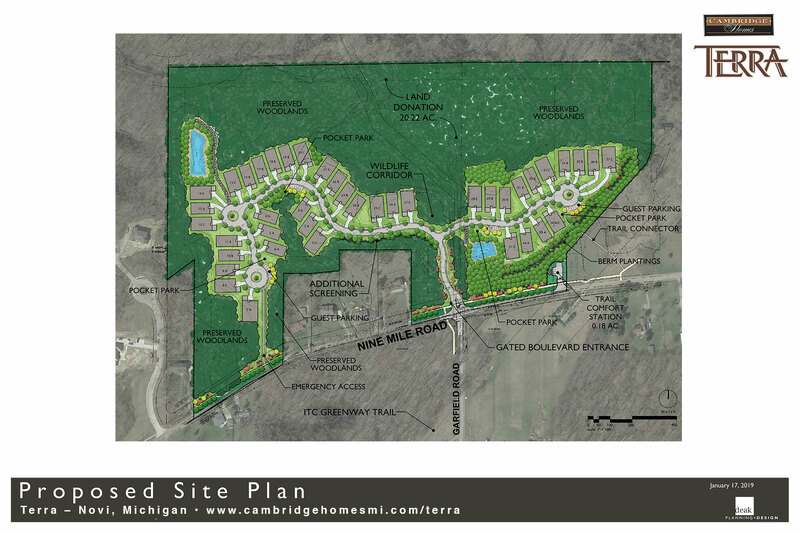 We designed our Terra community to be unlike any other in Southeast Michigan, with a taste of “Up North,” complete with the feeling of relaxation, serene calm and ‘get-away-from-it-all attitude’ that reminds us of lazy summer days. Terra has been carefully planned to provide an extraordinary living experience. Nestled in quiet seclusion beside 300-acres of protected parkland, the setting is incomparable. 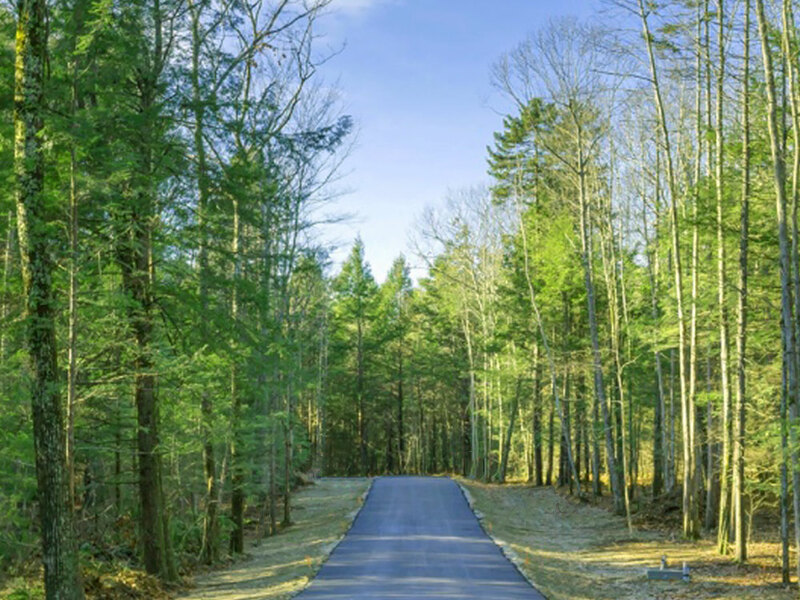 Each homesite takes advantage of natural features in the landscape. Each custom home expresses its owners’ vision, featuring the clean lines of Prairie-style architecture and built to the highest quality standards and attention to detail that Cambridge Homes has been recognized for. At Terra, you’ll enjoy your luxury lifestyle in a right-sized new home for the next phase of your life. Directions to Terra: From Eight Mile Road, turn north onto Garfield Road (between Beck Road and Napier Road). The entrance to Terra will be straight ahead at Nine Mile. Home styles in Terra take inspiration from some of our favorite architectural looks, including Prairie-style design. 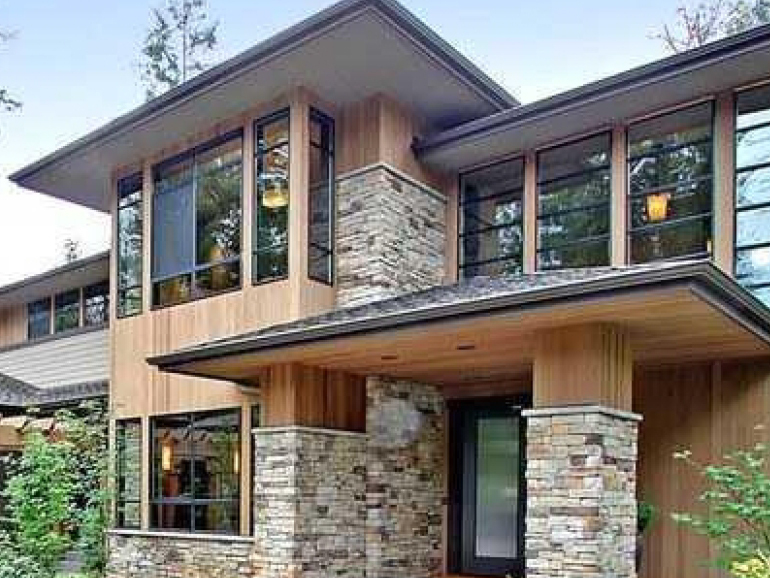 Cambridge Homes has selected top architects to marry elements from these classic home styles to create fresh, modern elevations designed to integrate beautifully with their surroundings. Each home is distinctive. Contemporary interiors define comfortable living spaces. At Cambridge Homes, we believe that your home should be your home. It should reflect your personal taste and style and include your must-have features – as well as desired extravagances! You’ll work one-on-one with our architects and interior designers to define the floor plan, elevation, finishes, and details for your one-of-a-kind custom home. We’re excited about advances in discrete home-based systems that use the power of the sun to generate electricity. Terra offers full or supplemental solar-powered electricity, as well as energy-efficient windows, heating and cooling systems, and appliances. You can feel good about taking an active role in reducing carbon emissions and helping to preserve the Earth’s resources. Interested in More Information on Terra? Excitement is building for this unique active-adult community. If you would like more information, or to be notified when we begin taking reservations, please reach out to us. We’d love an opportunity to connect.